I am a Research Officer with the Department of Agriculture and Food WA, based in Esperance. Having been born and raised in Perth and following graduation from UWA with a Bachelor of Science (majoring in Genetics and Zoology), my wish to pursue a career in science led me to my current role in agriculture in Esperance, a town 700km from home surrounded by, if you ask me, the best beaches in Australia. 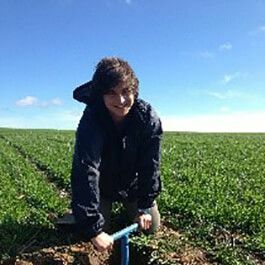 Being a wheat and barley research officer involves all steps of the research process, from trial planning, to seeding and carrying out in-season measurements, through to harvest and data analysis and interpretation. Coming from a background of no experience in agriculture whatsoever, I have had a lot to learn from day one. However, I enjoy the role immensely given the rewarding nature of research and gaining knowledge about how best to grow recently released wheat and barley varieties. Most of all, I enjoy the indoor/outdoor balance of the role, with no chance to get stuck in the office for too long when there are field days to present at, seminars to attend and measurements to take.